The dining-room table should occupy that position which will make the guests most comfortable, and give the most pleasing outlook. Let the chair to be occupied by the host be at the end of the table farthest from the door. The size of the table must always be adjusted to the number of guests. The top of the table must be kept polished and unmarred. Good form requires that the table be always uncovered when not in use. The details of setting the table and serving meals vary with the conditions, the times, and the taste of the hostess, the same as all things are swayed by fashion and necessity. There are some rules for setting the table which never change materially, and there is a medium in serving meals, as well as in other things, which is never conspicuous, not overdone, nor trying, because the guests are not made uncomfortable. Whether a beautiful and highly polished table shall be used with mats and doilies, or whether a plain table covered with a handsome, snow-white damask is more desirable, the hostess and the fashion at the time must de-cide. If the bare table is used, it must be protected in some way. Mats for hot dishes are often objectionable, because they do not combine beauty and utility. Hand-painted trays, with some device to prevent sliding, answer all conditions, but are very expensive. If the table is to be covered, it must be,made the proper size to accommo-date the number of people to be seated, then covered with a felt, and the cloth placed straight and smoothly over all. References: Boston Cook Book - Lincoln - pp. 439-443; The Expert Waitress - Springsteed. At each meal, see that such articles as the host may need are on a side table near that end of the room, and what the hostess needs are on a table near her. Oyster plates, salad plates, and dishes for ices should be cold, and soup dishes and meat and vegetable platters warm. Coffee and tea should be kept hot without deteriorating. 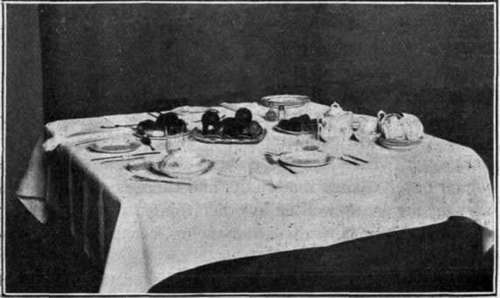 In beginning the meal, first serve the lady on the right of the host, then pass in regular order. When removing a course, take the food first.